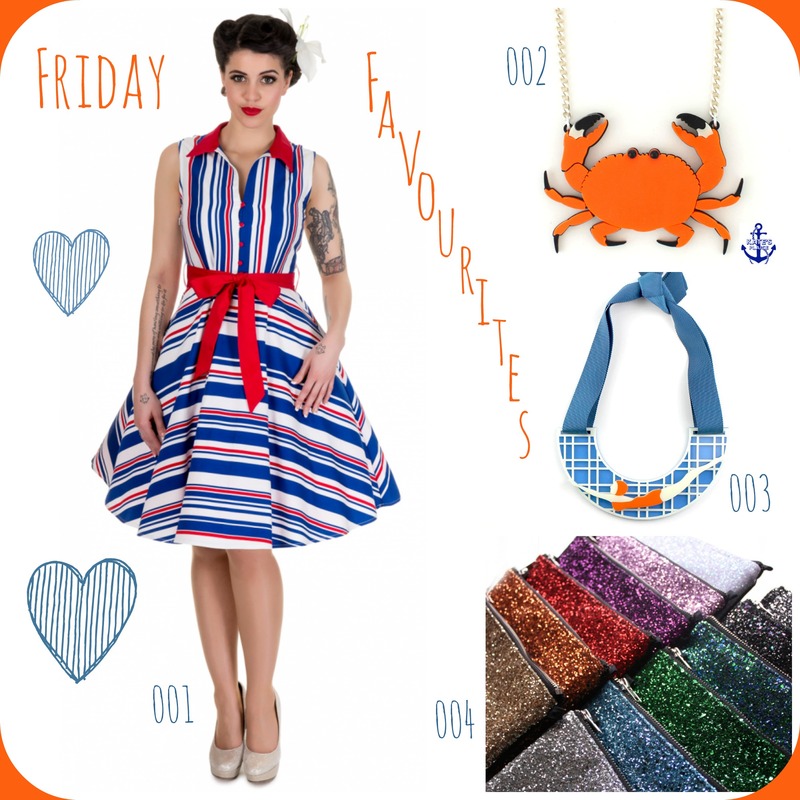 t*rexes and tiaras: Friday Favourites 182.. This week's wishlist has something of a summertime seaside vibe, but I can't help it - I've been looking at long overdue sunny weekends away - exciting times! The print on this Dolly + Dotty dress (001) just reminds me of a traditional deckchair print. Super cheerful, right? I'd totally team it with either of these Lou Taylor necklaces (002) and (003). A new find for me, online, but I would certainly love to add both of these necklaces to my collection. I love just anything nautical, and the art deco styling of this wonderful swimmer necklace. I do love swimming. Amy shared these glittery clutch bags (004) with me; what's a wishlist without a little glitter?! I love that these are large enough for all of the essentials for a night out, as well as being available in a rainbow of colour..! I have a cuddly crab just like that one! He is just as cute! I love all of these too apart from the clutch bags as I can't get on with tiny bags!! The glitter is nice though!! Keep and eye out for some large totes... ;) They're surprisingly roomy too actually! That diver necklace is awesome. Everything seems to be catching my eye this week, I've purchased slippers, a bikini and a clutch bag - not to be worn together obviously! Thanks so much for including the glitter bags in your post! In great company too - I ADORE Lou Taylor's jewellery! Mr Crabby is super cute and the dress would be perfect for a mosey round Margate in the Summer. I want yet another jacket I spotted in a consignment shop and some Pocahontas style boots! It's the perfect summer dress!